TURCK has announced Amphibian inductive proximity sensors, new liquid-sealed devices that consistently provide reliable sensing performance in extreme environmental conditions. The sensors can withstand high-pressure, high-temperature washdown in repeated wet cleaning operations, as well as resisting cooling lubricants and oils present in heavy machining operations. Their rugged construction includes stainless steel housings, with special PVDF front caps and Viton O-rings to resist the harshest environmental conditions such as liquid ingress and chemical attack, including aggressive detergents. Primary applications for these devices include sensing in manufacturing operations in the food and beverage, brewing, pulp and paper and pharmaceutical industries. The temperature range of the new sensors has been increased to 85°C (185°F) to resist thermal effects. The sensing range has also been increased allowing the sensors to be positioned further away from the process and out of harms way to reduce physical damage of targets striking the sensors. Sensing distances range from 3mm to 7mm depending on model. Higher front cap pressure ratings are 20 bar for 12mm sensors, 15 bar for 18mm sensors and 10 bar for 30mm sensors. 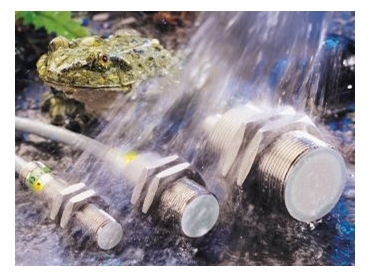 Amphibian sensors meet extremely high environmental protection ratings including IP68 and Turck's more stringent IP69K definition. This includes hot steam jet cleaning per EN 60529 and DIN 40050-9 where the sensor is subjected to 80°C ±5°C spray at 1250 to 1500psi directly on the sensor at a range of 4" to 6" in 30° angle increments for 30 seconds each for a total of 120 seconds. Other test procedures include heating the sensors to 85°C (185°F), storing the sensors in fluid for three days and retesting. The sensors are also tested in a wide variety of fluids. Detergents include three per cent soda lye (caustic), four per cent KSM 93 (pH 9.2), and perchlorethylene (PERC). Grinding and cutting oils include Megacut S and Megacut 22 (made by Daw Aerocit). Coolants tested include Karol (pH 9.1) and Aerolan 2400 (pH 9.0). The sensors are available in 12mm, 18mm and 30mm barrel housings in both PNP and NPN models, with prewired or quick disconnect cable. Prewired models are available with insulating plastic sleeve connections for additional cable protection. Sensit 03 9807 2798.